Children: $23.50: Ages 7 - 11. Must be at least 7 years old to attend this tour. 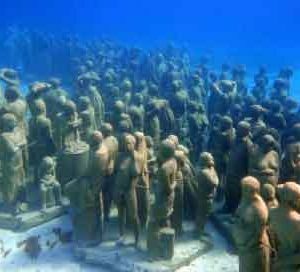 If you fancy trying something different and seeing something amazingly unique, come and enjoy our Cancun Underwater Museum Tour. 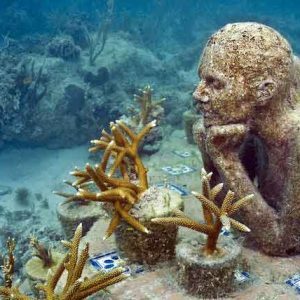 One of the most popular attractions in Cancun, the Underwater Museum (MUSA) is a must-see on a visit to the Mayan Riveria. 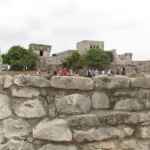 With this tour you will be given unlimited snorkeling at the Punta Nizuc area as well as a visit to the Cancun Underwater Museum. 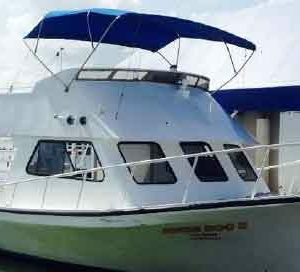 We will take you on a motor boat to the Punta Nizuc reef area where you will be dropped off at our floating platform where you will be able to relax, swim & dive from. 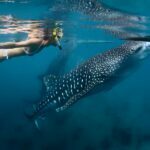 Here you will be supplied with snorkel gear beer and refreshments that are included with this tour. Once you got your snorkel gear on your ready to to take the plunge into the Carribean waters and snorkel as long as you like in the clear turquoise water. You can use this platform to hangout and dive from for as long as you like, after you are satisfied with your day of snorkeling then you will be taken back to you the marina. 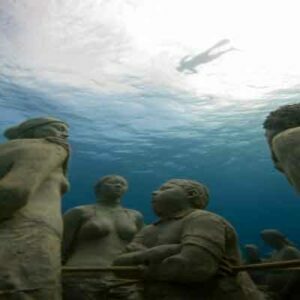 In this area, permitting weather, you will see 16 of the statues that form part of the Cancun Underwater Museum. These include ‘The Garden of Hope’, ‘Timebomb’, ‘The last Supper’ as well as the newest additions to MUSA created by local artist Elier Amado Gil. 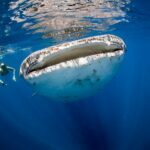 This tour will open your eyes up to the underwater world around Cancun and will keep you talking about the sites to friends and family for years to come. Tour operates Monday – Saturday, Departs at 9am, 10am, 12pm,1pm, 2pm.